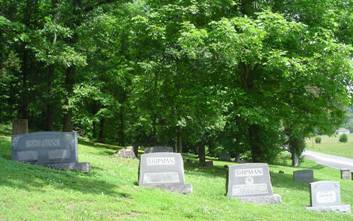 To reach this cemetery, travel north from the square in Waynesboro for .6 mile and turn left. Go .1 mile to TN Highway 64 and turn left. Travel 1.2 miles and turn right at the flashing caution lights. This is the Old Clifton Turnpike. Travel about 8.6 miles. The cemetery is on the right on the hill beside the road. Brown, Mary J.; b. ?? Sep 1840, d. 21 Jul 1905, wife of W.M. Cole, Luda Charlie; b. 27 Jul 1894, d. 08 Aug 1896, daughter of A.W. & H.E. Cole, Mary Gertrude; b. 26 Jun 1889, d. 21 Jul 1891, daughter of A.W. & H.E. Dicus, Emaline; b. 03 Feb 1843, d. 30 Dec 1919, wife of Lewis R.
Dicus, J.F. ; b. 1865, d. 19?? Newborn, Luvinia; b. 28 Feb 1845, d. 18 Sep 1884, wife of F.J.
Ricketts, B.V.M. ; b. 04 Aug 1892, d. 01 Oct 1897, daughter of W.G. & R.A.